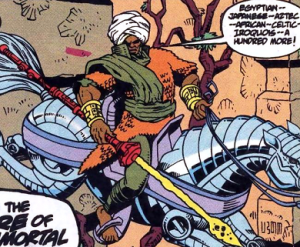 IS D.C. Universe Moor Character A Hero Or Villain? Is the Moor a Hero or Villain? It appears that he is Both. It seems he is a Villain to the Justice League but a Hero in his own homeland North Africa, I suppose that position would work the same way with the Justice League in the D.C. Universe. The Justice League would appear to be loved by Americans, besides Corporate Monguls like Lex Luthor, a native born american citizen, where as Clark Kent is merely a straw manwhose given name is Kal El, he is an Alien as far as the law is concerned of Krypton origin. 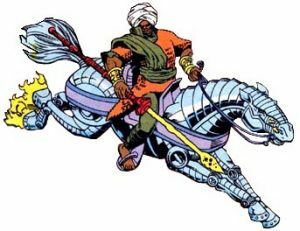 We need to see more activity from D.C. on Mohammaed Ibn Bornu’s character especially as it relates to the number one D.C. characters like Bruce Wayne, Wonder Woman, etc… Mohammed Ibn Bornu -aka Mohammed Ibn Bornu of the Moorish (Moslem) Equestrian Empire of Kanem-Bornu a North African hero with an electronic spear that fired bolts of lightning, he rode a flying robot horse. This character is or was primarily an enemy of the Justice League, in any of its various incarnations.